Perhaps the best defenseman so far this NHL season is one many fans have never really heard of, Morgan Rielly of the Toronto Maple Leafs. 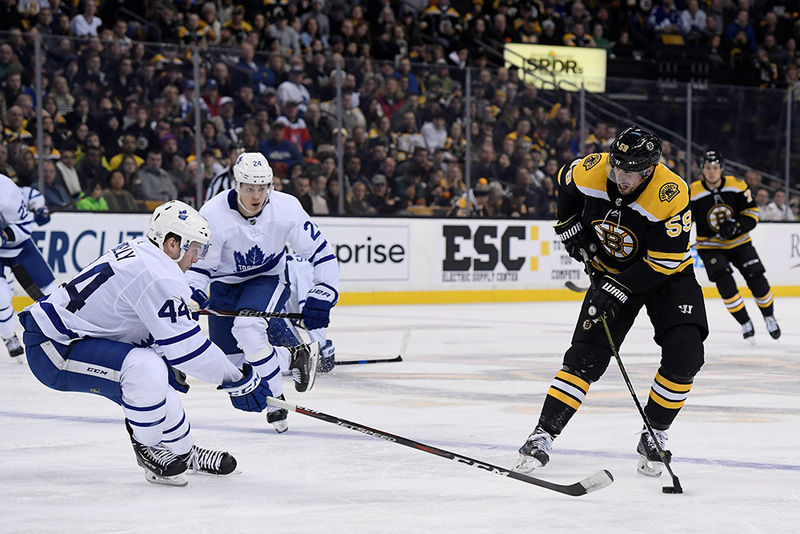 The 24-year-old is playing in his sixth season with the Leafs, but often flies below the radar even though he posted 196 points in his first 408 NHL games with another 10 in 13 playoff contests. The Leafs know just how valuable the native of Vancouver, British Columbia is though and that’s why he’s being paid $5 million a year. Rielly was drafted fifth overall back in 2012 and broke into the league a year later, scoring 27 points as a rookie. He’s contributed on the scoresheet consistently since then and at the quarter mark of this season he was the highest scoring defenseman in the league and in the top six overall with nine goals and 16 assists including a pair of overtime winners. You wouldn’t be wrong to say that Rielly isn’t very noticeable on the ice however. In fact, his good friend and fellow blue liner Jake Gardiner seems to be more of a presence most nights. But head coach Mike Babcock prefers his defenders to be as invisible as possible since it means they’re making fewer mistakes. Babcock has played Rielly and Gardiner together on occasion in the past and will still sometimes do so on the power-play or when his team’s desperate for goal. But with Rielly racking up six goals and 46 assists and Gardiner chipping in with five goals and 47 helpers for 52 points each last season, Babcock likes to spread the wealth around. Gardiner now usually plays with Nikita Zaitsev while Rielly partners up with veteran Ron Hainsey. But while Rielly is undoubtedly talented in the other team’s end of the rink is he good enough in his own end to be considered Norris Trophy material? In this era the answer is probably yes since the best-defenseman-in-the league award usually goes to the offensively gifted. So let’s forget that Rielly’s a minus-60 for his career because he’s a plus-10 this season. Naysayers may point out that Rielly should be picking up plenty of points since he’s playing for one of the highest-scoring teams in the league which boasts several gifted snipers. That’s true, but don’t forget the unsigned William Nylander hasn’t played all year and Auston Matthews has missed much of the campaign due to a shoulder injury. Rielly creates his fair share of scoring chances at even strength and has proven to be a valuable power-play performer this year with 10 of his 25 points coming with the man advantage. That being said, he doesn’t have a big shot from the point, but is pretty lethal in close because of a fine wrist shot. He’s not a small guy by any means at 6-foot-1 and 220 lbs, but doesn’t play an overly-physical game. He knows how to take his man out of the play though and has dramatically cut down on giveaways this season. Rielly goes about his job in a workmanlike fashion without much flair or fanfare and that could be a major reason he isn’t really known outside of Toronto. If we check out the top-scoring defenseman this season we find Rielly’s main competition comes from Thomas Chabot of the Ottawa Senators, Brent Burns of the San Jose Sharks, John Carlson of the Washington Capitals and the Calgary Flames’ Mark Giordano. I think we’ll also be able to add Erik Karlsson to the list once he gets used to things with his new teammates in San Jose. It’s certainly a matter of opinion, but at the moment, I’d rank Rielly ahead of only Chabot on this list…and not by much either. Rielly is an excellent skater and has the wheels to go coast to coast, but he doesn’t do it as often as he could or should even though he appears to have the green light from Babcock. I do think Rielly has improved quite a bit in his own end as he matures and gains experience. He definitely hasn’t been used as a shutdown defenseman during his career and in 2015/16 he was on the ice for the third-most goals against in the league at 111. The next season wasn’t much better as he ranked sixth in the NHL for total goals against at 105. If we look at that stat this season, we see Rielly was ranked second for being on the ice in total goals for at 43. So while the odds of the Leafs conceding a goal while Rielly was out for a shift were pretty high a couple of years ago the opposite is now true. When Rielly’s on the ice this year there’s a good chance he or one of his teammates will deposit the puck in the net. Rielly has a knack of knowing exactly when to join the play when his team’s on the attack, rather than lead it himself. But if he could take the bull by the horns a bit more and be more aggressive with the puck he could easily be a legitimate Norris Trophy candidate one day. And at 24 years of age there’s a good chance his name will one day be engraved on it, but it likely won’t be this season. What he is could accomplish this season though is to set some new personal and franchise highs. His previous best in goals, assists and points are nine, 46 and 52 while club records in those categories for a defenseman are 22, 66 and 79. If he can keep up his current pace Rielly will finish the season with 40 goals and 62 assists for 102 points. If that happens, then I take back what I said before and he will win the Norris this year.